Parker School celebrated its Ohana Day on Wednesday, Nov. 21. 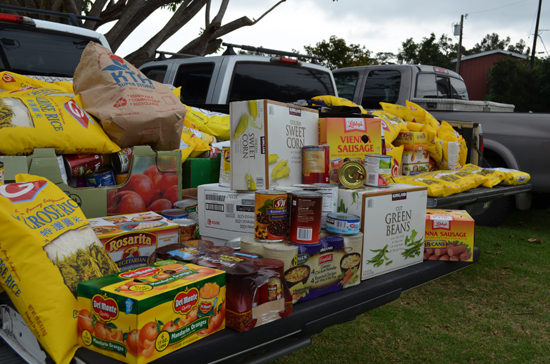 This day marked not only the start of Thanksgiving break and a morning gathering of the school community, but also the culmination of a two-month long school-wide canned food drive launched by the student council to benefit the Annunciation Food Pantry and the Kokua Ministry at Imiola. At 10:45 a.m., all kindergarten through twelfth grade students, faculty, staff and several Parker families gathered on the lawn in front of the school’s theater where six pick-up trucks and an SUV, fully loaded with heaps of cans and bags of rice, were parked for all to see. Headmaster Carl Sturges addressed the crowd, announcing that the food drive ended up gaining so much momentum, student participation and enthusiasm, that the original 20,000 ounce goal was quickly surpassed. The final tally of donated food was 153,541 ounces, which equals 9,586 pounds. The grade levels competed against each other for prizes to collect the most amount of food, and prizes were also given to individuals who brought in the most food. Big Island Eco Adventures donated a zip-lining trip for the highest performing high school class, and this prize went to the ninth graders, who raised 1778 pounds. KBXtreme (the bowling alley in Kona) donated shoes, two rounds of bowling, and ten tokens (a party package), for each of the students in the highest performing middle school class. This prize went to the sixth grade, who collected 2863 pounds. The individual prizes included a ride for two with Kohala Ditch Adventures, run by ATV Outfitters, snorkel and whale-watch cruises from Ocean Sports, Starbucks gift certificates and merchandise, and Visa gift cards purchased from the student council’s funds.­ Parker School wishes to thank these organizations for generously donating the student prizes. Assistant Head Shellie Gressard said the sixth graders were so motivated they even manned collection carts outside of Foodland up until 30 minutes before the event. They also all dipped into their own piggy banks, coming up with a total of $1,000 to purchase rice for the drive. After Sturges’ announcement at the ceremony, he welcomed Reverend Robert Shwarzhaupt of Annunciation Catholic Church in Waimea, to bless the food before it was taken to be delivered to the food bank. Annunciation Catholic Church is one of The Food Basket’s food pantry locations. In addition to all the prize and food donors, Armandroff also wishes to thank her fellow food drive committee members Lorenzo Arnouts and Sean Dunnington for their hard work.